I'm lying on my back in a gigantic picnic basket in the middle of Kenya's Masai Mara. The last stars are being snuffed out of the sky above me; my breath is puffing out like smoke into the cold air. I focus on these simple things. Better them than the fact that I'm about to be yanked into the sky by a nylon balloon as tall as a 10-storey building, filled with nothing but hot air. Ballooning over exotic locations might be on some people's bucket lists, but it had always been on my not-if-you-paid-me-a-million-bucks list. It just didn't feel like the right holiday activity for a mildly acrophobic, catastrophising control freak such as myself. Even the thought of it made me feel all wobbly. When the opportunity to balloon over the surreal landscapes in Turkey's Cappadocia region came up four years ago, I politely declined. Ditto in Queenstown, New Zealand, despite knowing I'd probably never make it to these places again. Screw living for the moment, I'd thought at the time – I just wanted to live, period. Had I felt FOMO after missing those opportunities? Not immediately. In fact, I had congratulated myself for not bowing to the pressure, and in Cappadocia had actually convinced myself that I got the best snaps from the ground. Which I really didn't. I'd like to say je ne regrette rien, but I did come to regrette that a little. Which is why I'm here. Sweaty-palmed and shaking, about to hitch a ride with Balloon Safaris, who've flown the likes of Jackie Onassis, Robert Redford, and Goldie Hawn over Kenya. I am determined to look my demon in the face, shake its hand and maybe even make a friend out of it. A few blasts of fire into the balloon from our cranky Russian captain and our cane basket is upright. There's a sudden feeling of weightlessness as we life off the grass, gaining height with each passing second. Inside the basket, there's a peace I hadn't expected. Without the whir of an engine, it is quiet and meditative, nothing but the wind whispering by, the first birds warbling their wake-up song, and the occasional fire blast to get us more altitude. There are 16 of us on this flight, but no one feels the need to speak. 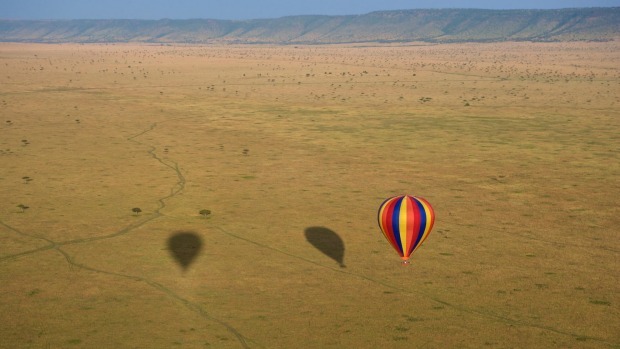 The point of ballooning in Africa – an idea first conjured in 1862 by Jules Verne in his novel Five Weeks in a Balloon, and finally executed 100 years later by English writer and balloonist Anthony Smith – is, of course, to spot game from above. Looking over the edge of the basket is the most terrifying thing I can imagine. But I take a deep breath, will my shaking legs to behave, and do it anyway. 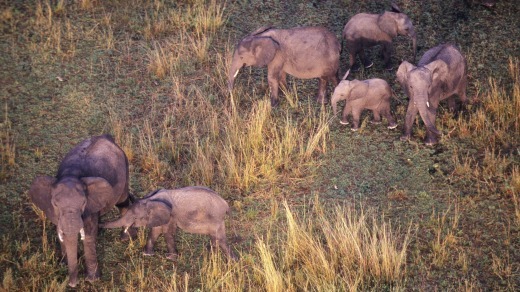 Below, I see elephants loping by and impala leaping through the grass, their shadows long in the morning light. A few other balloons waft by in the distance, but there's not a single man-made structure as far as the eye can see. The unfathomable vastness of the Mara is revealed from up here, too, the great nothingness of it spreading out below us like an endless golden quilt. Slowly, my fear is hijacked by the serenity of the experience. By the time we scud back across the earth (a far less harrowing experience than you might imagine), I am a ballooning convert. And as we devour our post-flight champagne breakfast served in the middle of the bush, I'm reminded that to be a good traveller, every so often you need to meet your edge, and tip right over it. Comfort zones and neuroses are for home; travel is for pushing through barriers and discovering what lies on the other side. 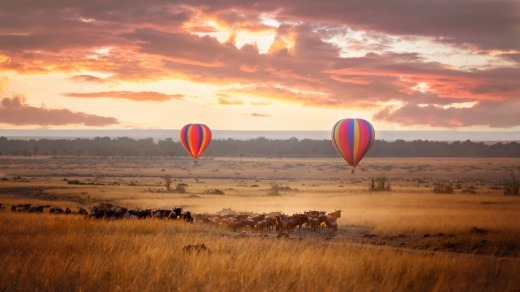 Balloon Safari over Kenya's Masai Mara.